Answer: Certainly. And they have a better view than we do, since they can’t be clouded out. 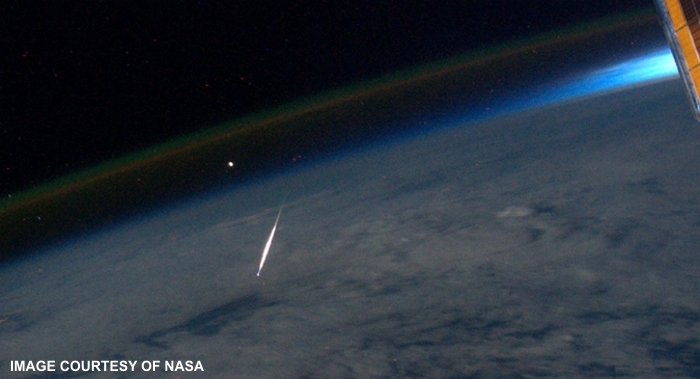 During this most recent Perseid meteor shower, astronaut Ron Garan aboard the International Space Station (ISS) shot the above photo of a meteor burning up in Earth’s atmosphere. You might wonder if there’s any danger to astronauts during meteor showers. The answer is “yes.” Space is always a dangerous place to be, even without a meteor shower happening. The ISS and other spacecraft have suffered hits on several occasions. Fortunately, none of the particles were large enough to do significant damage. Had the hull been breached, and the internal air pressure compromised, secondary airlocks and emergency repair protocols would protect astronauts from all but the largest impacts. Interestingly, amateur astronomers have made videos of the Moon during meteor showers. On two occasions I know of, they’ve captured meteor impacts on the unlit portion of the lunar disc. They weren’t much to look at, as the impact produced a flash of light lasting only 2-3 frames, and only about one pixel in size. Since the Moon has no atmosphere to heat the meteor on entry, you don’t get a streak of light like we see here on Earth. But you do get a flash on impact when the kinetic energy of the meteor vaporizes part of the lunar surface. Meteor Shower from Space. I loved that photo! I’m working my way through your portfolio. Keep up the good work. Nice looking blog.